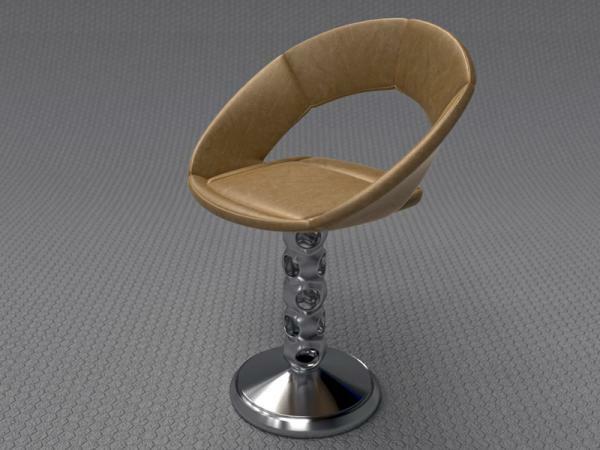 This is a model of the modern Saturn Chair; a contemporary, elegant design which comes in several variations, of which this is my personal favorite. This model can easily provide a modern look and feel to your arch/viz interior renders, or it could also work very nicely as a character prop. The model is available as a native 3dsmax 2012 scene file (.max), and also in several scaled .obj formats, for importing easily into other applications, like Blender, Poser, or Daz|Studio. It comes complete with COLOR and BUMP texture maps for the SEAT portion, including 3 different leather color styles to choose from, so it will be easy to match this chair with almost any interior decor! You could also apply just about any procedural or tileable material, and it should map nicely. The metal base portion is also UV mapped, but doesn't require any color or bump textures; any basic raytraced metal or plastic shader will work nicely for that. The topology is all "quads", with a detailed, but optimized poly count of just 25,898, and 25,868 verts. The geometry is well suited for medium to very close up renders, and has been tested to render cleanly, even with unbiased, path-tracing render engines. Another modern classic, so well made. Wickerman (5 years ago) Inappropriate? Excellent job, I really love the seat!